SmartLab launches new website and new features! 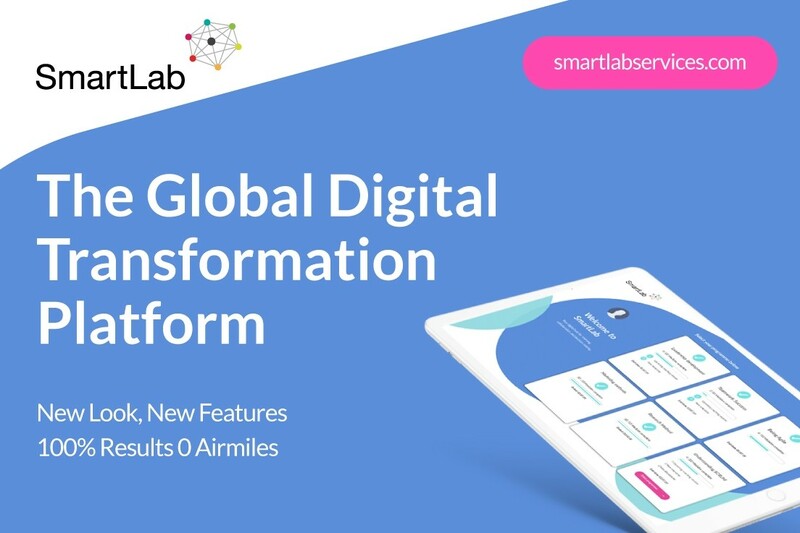 SmartLab, the award-winning digital hub for people and business transformation, trusted by the world's leading organisations, launches a new website and new features, further expanding on the adaptive, personalised, data driven experience. Combining a powerful platform with ground breaking tools & methodology, it makes the delivery of large-scale programmes simple, across time and distance with 100% results and Zero Airmiles. Developed by Ludic, SmartLab is transforming the way professional service SMEs deliver global change programmes, faster, better and cheaper. It supercharges global programme delivery with a proven track record for delivering tangible strategic outcomes both for the individuals and for the business. SmartLab is the place for collaboration, strategic alignment and decision-making, people engagement and for delivering powerful learning experiences. "It's the ultimate digital transformation toolkit to equip your business to thrive in a Digital world. It supports organisations at every step of their transformation journey, far faster and more cost effectively than ever before" said Garrick Jones, Ludic's Founding Partner. SmartLab's digital learning offering, whether it is a blended learning programme, a personalised and flexible digital learning experience, a learning game or digital coaching, provides dynamic learning, using the best of digital technologies, including VR, AI, Gamification and many more. Ludic with its SmartLab digital learning offering has been recognised as Core Leader in the 2019 Fosway 9-Grid™ for Digital Learning and selected in the top 15 highest performing learning technologies providers, by the LPI. "We're delighted to be recognised as leaders in the Digital Learning space. We continuously invest in our experience platform SmartLab and are proud to be delivering ground-breaking programmes both in scale and in quality of delivery" said Paul Ashcroft, Ludic's Founding Partner. As the ultimate collaboration and decision-making digital hub, SmartLab, enables organisations provide more agile ways of working, accelerate decision making, achieve strategic alignment without the need of face to face meetings, wherever people may be in the world. SmartLab's technology, enables organisations to activate people, providing personalised, state of art people engagement campaigns and empower them to driving change. SmartLab enables the design and delivery of powerful, facilitated events and immersive experiences digitally. Bringing together a structured process, expert facilitation and state-of-the-art collaboration tools to advance your work, wherever in the world your participants may be, SmartLab delivers memorable and impactful design events. SmartLab is ideal for aligning your key stakeholders and shaping your organisational future. "Personalisation, artificial intelligence and analytics are the next big shift in digital, achieving better results for the individual, as the experiences will be even more adaptive to users' behaviours and preferred styles, while providing measurable outcomes for the business. Engaging your people in powerful and impactful digital experiences will activate your organisation's full potential and achieve faster results, said Clemens Hackl, SmartLab's Development Director. Discover SmartLab's services and exiting new features including new, more intuitive interface, new learning libraries for self-directed and guided learning, new more in-depth reports and more gamified user engagement. SmartLab for Learning– Create and deliver transformative learning programmes. SmartLab for Engagement– Activate your people in change. SmartLab for Collaboration– Collaborate and make decisions across time and distance. SmartLab for Decision Making– Use agile tools to make better decisions. SmarLab for Design Events– Deliver powerful design events online. Enable your people and business to transform digitally and evolve.